Muhammad (may Allah bless him and his Ahlul-Bait), the Apostle saw the afflictions of his companions and that though he escaped it because of his standing with Allah and his uncle, Abu Talib, he could not protect them. He suggested to them to leave Mecca and to seek sanctuary in Abyssinia (Ethiopia) which was then ruled by a Christian king, well-known for being a just and God-fearing man. So, a group of Muslims, comprising eleven men and four women, which included Uthman bin Affan, a future khalifa of the Muslims; his wife, Ruqayya; and Zubayr bin al-Awwam, a cousin of the Prophet left Mecca and went to Abyssinia. The Prophet appointed Uthman bin Mazoon, one of his principal companions, as the leader of this group. This was the first hijra in Islam which took place in the fifth year of the Proclamation – in A.D. 615. The king of Abyssinia welcomed the Muslim refugees from Mecca into his kingdom and they enjoyed peace, security and freedom of worship under his aegis. About a year later, the Muslims in Abyssinia heard rumours that the Quraysh in Mecca had accepted Islam and so there was no reason for them to live in exile. They were homesick, and they decided to return to Mecca. But upon their arrival in Mecca, they found out that not only the rumors they had heard were false, but also that the Quraysh had stepped up the persecution of the Muslims. They, therefore, left Mecca once again. Many other Muslims also accompanied them. This new group comprised 83 men and 18 women. Muhammad appointed his first cousin, Jaafer ibn Abi Talib, an elder brother of Ali, as the leader of this group. This second migration of the Muslims to Abyssinia took place in the sixth year of the Proclamation, which corresponds to the year A.D. 616. The migration of the Muslims to Abyssinia, and the friendly reception they got there, alarmed the Quraysh. They feared that Muslims might grow in strength, or find new allies, and then, some day, might return to Mecca to challenge them. To head off this potential threat, they decided to send an embassy to the court of the king of Abyssinia to try to persuade him to extradite the Muslims to Mecca. The Muslim refugees who had expected to be left in peace, were surprised by the arrival, in the Abyssinian capital, of an embassy from Mecca, led by Amr bin Aas who had brought rich presents for the king and his courtiers. When the king gave audience to the emissary of the Quraysh, Amr bin Aas said that the Muslims in Abyssinia were not refugees from persecution but were fugitives from justice and law, and requested him to extradite them to Mecca. The king, however, wanted to hear the other side of the story also before giving any judgement, and summoned Jaafer ibn Abi Talib to the court to answer the charges against the Muslims. 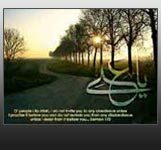 Jaafer, the son of Abu Talib, and brother of Ali, consequently the cousin of Mohammed, was a man of persuasive eloquence and a most prepossessing appearance. He stood forth before the king of Abyssinia, and expounded the doctrines of Islam with zeal and power. "O King! We were ignorant people and we lived like wild animals. The strong among us lived by preying upon the weak. We obeyed no law and we acknowledged no authority save that of brute force. We worshipped idols made of stone or wood, and we knew nothing of human dignity. And then God, in His Mercy, sent to us His Messenger who was himself one of us. We knew about his truthfulness and his integrity. His character was exemplary, and he was the most well-born of the Arabs. He invited us toward the worship of One God, and he forbade us to worship idols. He exhorted us to tell the truth, and to protect the weak, the poor, the humble, the widows and the orphans. He ordered us to show respect to women, and never to slander them. We obeyed him and followed his teachings. Most of the people in our country are still polytheists, and they resented our conversion to the new faith which is called Islam. They began to persecute us and it was in order to escape from persecution by them that we sought and found sanctuary in your kingdom." When Jaaffer concluded his speech, the king asked him to read some verses which were revealed to the Prophet of the Muslims. Jaafer read a few verses from Surah Maryam (Mary), the 19th chapter of the Holy Qur’an. The king heard these verses, and said that their fountainhead was the same as that of the verses of the Evangel. He then declared, to the great chagrin of Amr bin Aas, that the Muslims were free to live in his kingdom for as long as they wished. Jaafer said: "Our judgment of Jesus is the same as that of Allah and His Messenger, viz., Jesus is God's servant, His Prophet, His Spirit, and His command given unto Mary, the innocent virgin." The king said: "Jesus is just what you have stated him to be, and is nothing more than that." Then addressing the Muslims, he said: "Go to your homes and live in peace. I shall never give you up to your enemies." He refused to extradite the Muslims, returned the presents which Amr bin Aas had brought, and dismissed his embassy. Muslims spent many years in Abyssinia and lived there in peace. Thirteen years later – in 7 A.H. (A.D. 628) – they returned, not to Mecca but to Medina. Their arrival synchronized with the conquest of Khyber by the Muslims.